Pyramid schemes are a very old con – but whilst illegal, still exist in various forms. Understanding the maths behind them therefore is a good way to avoid losing your savings! There are lots of variations – and now that most people are aware of pyramid selling, now normally revolve around multi-level-marketing (MLM). These are often still pyramid schemes, but encourage participants to believe it is a genuine business by actually having a sales product which members have to sell. However the main focus of the business is still the same – taking money off people who then make their money back after having signed up a set number of new recruits. 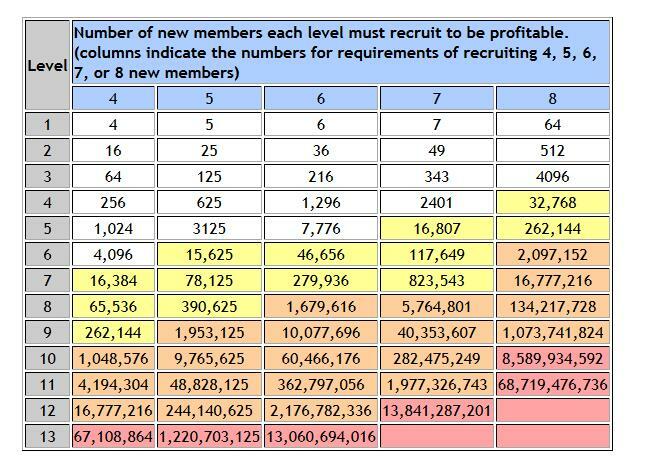 You can see that if the requirement was to recruit 8 new members, that by the 9th level you would need to have 1 billion people already signed up. Even with the need to recruit just 4 new members you still have rapid exponential growth which very quickly means you will run out of new potential members. 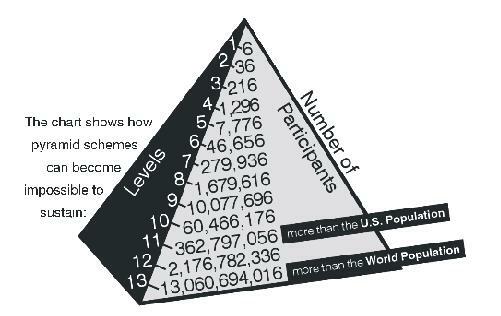 For pyramid schemes it is only those in the first 3-4 levels (the white cells) that stand any real chance of making money – and these levels are usually filled by those in on the scam. Ponzi schemes (like that run by Bernie Madoff) use a similar method. A conman takes money from investors promising (say) 10% annual returns. Lots of investors sign up. The conman then is able to use the lump sum investments to pay the 10% annual returns. This scam can last for years, with people thinking that they are getting a good rate of return, only to find out eventually that actually their lump sum investment has gone. This is a good topic to look at with graphs (plotting exponential growth), interest rates, or exponential sequences – and shows why understanding maths is an important financial skill. Benford’s Law – Using Maths to Catch Fraudsters – the surprising mathematical law that helps catch criminals. Amanda Knox and Bad Maths in Courts – when misunderstanding mathematics can have huge consequences .